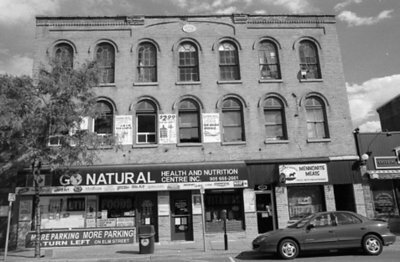 A black and white photograph of 121 Brock Street North. It contains two stores, the store on the left side is Go Natural Health & Nutrition Centre Inc. and the store on the right is Mennonite Meats. Perry's block was a three-storey brick building on the east side of Brock Street, north of Dundas Street. It was built by John Ham Perry in 1858. The building was destroyed by fire on June 10, 1864 and was replaced by McMillan's Block the same year. 121 Brock Street North, October 2005, Carl Ferencz. Whitby Archives A2013_016_005C.